First Line: "If the Wild Poppy dared return to Galatea, Citizen Cutler was ready." Review: For Darkness Shows The Stars was one of my favorite reads by Diana Peterfreund so when I saw she had a second book in the series coming out I was ecstatic, until I realized it wasn't going to be about Kai and Elliot but a whole slew of new characters, I was kind of eh I don't know sad...BUT this author is freaking amazing Across A Star Swept Sea was a wonderful read and I was jumping up with joy when Kai and Elliot made an appearance in the novel later on towards the end...it just really made my day. Anyways on to the review. Across A Star Swept Sea was a re-imagining of The Scarlet Pimpernel. All I know is it takes someone very clever to play the roll of someone incredibly air-headed on purpose and that is who Lady Persis Blake is, a brilliant minded girl who plays the role of a very popular socialite that everyone has pegged out to be dumb and only cares about fashion and other frivolous things. They don't realize it's all an act, a means to an end, no one has any clue she is the Wild Poppy who is notorious for helping the people of Galatea by rescuing them and bringing them to her land Albion. Needless to say I loved her character right off the bat. She was taking such a huge risk with her life and her sanity since there was a huge risk of her being turned into a Reduced if she got caught. I seriously admired her bravery and selflessness. The world building was phenomenal which I didn't expect any less from Peterfreund. I do recommend reading the first book though because it will help you understand the world in this book a little bit more. 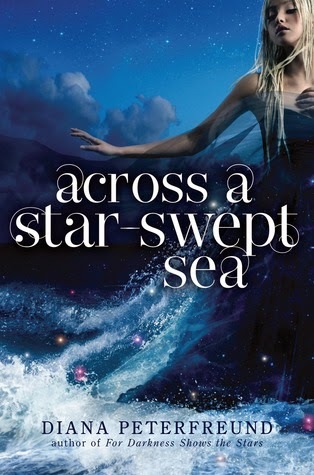 The only negative thing I can think of about Across The Star Swept Sea would be the first few chapters of the book, it started off a little slow and unlike For Darkness Shows the Stars this one took me a minute to get into but once I did I could not put it down. Another thing I really loved was the romance, this had that slow building romance where you are just dying to see the two come together but you know it wont happen not when Justen thinks Persis even though very beautiful is brainless and wants nothing to do with her but tolerates her because she knows all the right people and then there is Persis who had conflicting feelings for Justen. First off she was falling for him but she was ready to kill him also because she thought he was working with the enemy and was a spy. It all made for a very fun and exciting read. Overall an awesome read and I can't recommend it enough. ~"No one is innocent in the tide of history. Everyone has kings and slaves in his past. Everyone has saints and sinners. We are not to blame for the actions of our ancestors. We can only try to be the best we can, no matter what our heritage, to strive for a better future for all." ~"If they didn't take you seriously, they would never see you coming."